Happy Thanksgiving! Whether you’re a Mansfield customer, a supply or carrier partner, or simply a fan of fuel markets – thank you for choosing FUELSNews as your source for market analysis. We will resume our daily publication on Monday, November 26. 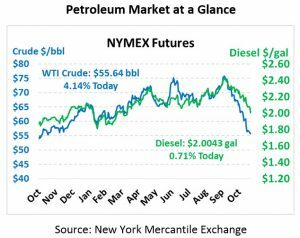 Once again the markets took a huge hit yesterday, with crude and gasoline reaching new annual lows while diesel fell to a 7-month low. Although holiday week trading tends to be light, yesterday saw volumes swell to become the 5th heaviest trading day of 2018. WTI crude sank $3.40 yesterday as the stock market plummeted, both tracking fears of weakening growth in developing economies. Crude this morning is rallying to recoup some of the losses, trading at $55.64 for a $2.21 gain (+4.1%). Fuel prices took a sizable hit yesterday, with gasoline prices shedding 9 cents while diesel prices were down 7 cents. This morning, diesel prices are trading at $2.0043, up 1.4 cents after closing below $2/gal for the first time since April this year. Gasoline prices have picked up 4.3 cents to trade at $1.5386, after closing below $1.50 for the first time since July 2017. Leading up to the December 6 OPEC meeting, markets are closely watching OPEC members for clues of the outcome. The UAE, Saudi Arabia, and Iraq all appear to be on-board with production cuts, representing the bulk of the decision-making power in OPEC. However, Russia still has not shown any interest in complying, leaving some to wonder whether OPEC+ will become just OPEC in 2019. The EIA’s data this morning completely contradicted the API’s forecast. While the API reported a surprise crude stock draw, the EIA showed a build nearly double the market’s expectations. Diesel’s draw this week was underwhelming, and gasoline showed a steeper draw than expected (contrasted against the API’s predicted build). In other EIA news, refinery utilization climbed to 92.7%, bringing utilization back into the 90s and signaling the end of refinery maintenance season. Refiners are focusing on pumping out more distillates now, cutting back gasoline output given the 50-cent premium on diesel currently and causing a marginal boost in distillate production.